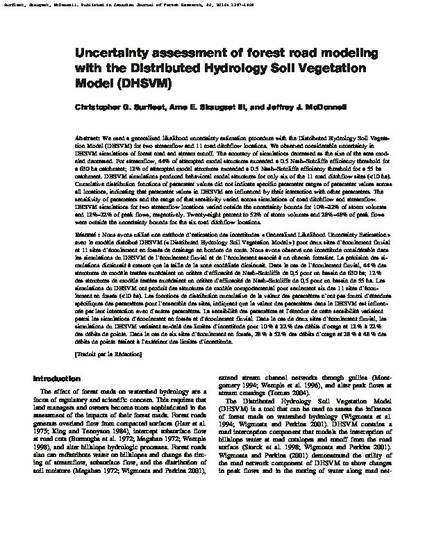 We used a generalized likelihood uncertainty estimation procedure with the Distributed Hydrology Soil Vegetation Model (DHSVM) for two streamflow and 11 road ditchflow locations. We observed considerable uncertainty in DHSVM simulations of forest road and stream runoff. The accuracy of simulations decreased as the size of the area modeled decreased. For streamflow, 44% of attempted model structures exceeded a 0.5 Nash–Sutcliffe efficiency threshold for a 630 ha catchment; 12% of attempted model structures exceeded a 0.5 Nash–Sutcliffe efficiency threshold for a 55 ha catchment. DHSVM simulations produced behavioral model structures for only six of the 11 road ditchflow sites (ha). Cumulative distribution functions of parameter values did not indicate specific parameter ranges of parameter values across all locations, indicating that parameter values in DHSVM are influenced by their interaction with other parameters. The sensitivity of parameters and the range of that sensitivity varied across simulations of road ditchflow and streamflow. DHSVM simulations for two streamflow locations varied outside the uncertainty bounds for 10%–22% of storm volumes and 12%–22% of peak flows, respectively. Twenty-eight percent to 52% of storm volumes and 28%–48% of peak flows were outside the uncertainty bounds for the six road ditchflow locations.